Your Plant-Based Guide Conference is a two-day, live health conference in Southern California that will educate, guide, and help those interested in improving their health, preventing climate change, and reducing animal suffering. Costa Mesa, CA, February 26, 2018 --(PR.com)-- Award-winning author, Certified Vegan Nutrition Specialist, and founder of 360 Health Connection, Gina Bonanno-Lemos healed herself of chronic, life-long health conditions with a plant-based diet. She now intends to pay it forward by harnessing the power of the burgeoning plant-based movement, to save lives and save the planet with Your Plant-Based Guide Conference. At the live, vegan training event scheduled for May 19 and May 20, 2018 in Costa Mesa, California attendees will experience two jam-packed days of presentations and nutritional training provided by one-dozen world-renowned physicians, celebrity weight-loss, fitness, and health experts, a climate change expert, and others. Featured conference presenters include industry powerhouses such as Dr. Joel Kahn, Dr. Michael Klaper, Dr. Brooke Goldner, Robert Cheeke, and Ocean Robbins. Attendees and the general public are invited to enjoy The Plant-Based Marketplace - a free and open exhibitor's area featuring new and delicious plant-based products. In addition, both ticket holders and the general public have access to the Author's Area, where presenters will sign and sell their books as they meet and speak with attendees. A Saturday night dance party and Sunday morning yoga class are included in the ticket prices, and ticket holders will be provided with training books and recipes, to help guide them to their new lifestyle in a sustainable and healthy way. 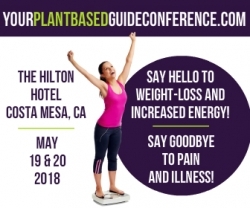 Your Plant-Based Guide conference is for anyone interested in preventing and reversing disease, increasing their energy level, living without aches and pains, and discovering how to build muscle with plant foods. Both existing plant-based eaters and the vegan-curious will benefit from the essential and life-saving information shared at the conference. For media inquiries and press pass availability contact the event organizer. 360 Health Connection is a health company and blog created to help people achieve optimum wellness with the power of plant-based nutrition and other lifestyle choices that directly affect the epigenome.